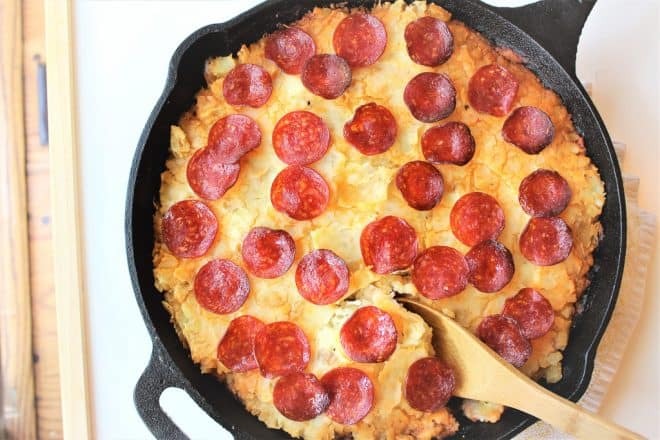 Paleo Skillet Pizza Shepherd’s Pie comes together with a handful of kitchen staples for an easy weeknight meal that fills your kitchen with the intoxicating smell of pizza, without all the grease! You can thank my pregnancy for this recipe. So far, my only real craving has been cheese. No, there’s not any cheese in this recipe (although I bet it would be delicious if you added some in!). There was no cheese left in the fridge, because I’ve been eating it with basically every meal every day. BUT, I was craving pizza, so I figured I could fool myself into it with some italian seasoning and pepperoni. IT WORKED. This was a perfect no-fuss weeknight meal that satisfied my pizza craving without calling in a delivery order. It’s like a shepherd’s pie, but with pizza flavors. You on board?? My son is home for summer break, so I got to work in the kitchen during his naptime. It reduces dinner time stress SO MUCH when I have something that just needs to heat up in the oven. Teddy doesn’t like mixtures of food together, so I set aside some ground turkey for him before adding all the seasonings, and I also set aside some plain mashed potatoes for him. I HATE having to make different meals for him, so I love a recipe like this where I can separate out some components and the whole family can eat basically the same thing. First, I roughly chopped the potatoes while heating a pot of water to boil them in. You can peel them if you want, but I’m lazy and also don’t mind the added texture (and nutrients!) from the peels. Once those are in the pot, get to work on the turkey filling. You can use ground beef or pork or whatever you’ve got on hand. I just happen to have a freezer full of ground turkey from a recent Costco trip, so that’s what I used. I chopped up the whole onion even though I didn’t need the whole thing so I could throw the extra in the fridge and use it up later this week. I didn’t add any garlic, and you typically won’t see me add any to recipes. My husband doesn’t do well with garlic. You’re like “WHAAAAT, YOU DON’T COOK WITH GARLIC?” I know. I went through a mourning phase and now I’m just used to it. All that being said…throw in a chopped clove or two in my honor. So you’ve got the turkey and onions cooking up, you can also throw in your diced peppers at this point if you’re using raw. I have a bag of pre-cooked diced green+red+yellow pepper strips in my freezer, so I threw them in towards the end just to warm them through. Once the turkey is browned, add in the tomato sauce and seasonings. My turkey was lean so I didn’t feel like I had to drain it off, but if you use a fattier meat you may want to dump off some grease before adding in the sauce and seasonings. Now you’ll have something like this. Your potatoes are likely cooked through at this point too. Check to see if a fork easily pierces them. Drain the potatoes and return to the pot. Use a potato masher or ricer to mash them up. Then add the broth, ghee (or butter if you don’t need it to be paleo/milk-free), and salt and pepper to taste. Mash some more. You may need some extra broth or ghee – just taste as you go until you are happy. Now, spread the potatoes on top of the meat layer in the skillet. I added the pepperoni at this point, but it cooks so fast that you really can wait to add it until it’s about halfway done baking. I let it cool off while I cleaned up the kitchen, and then stuck the whole thing right into the fridge for later. You could even do this a day ahead if you wanted to. When you’re ready to eat, just pre-heat the oven to 375° F (or 350 if you’re using convection) and bake for 30-45 minutes. Baking time will be closer to 30 minutes if you are making it right away and didn’t refrigerate first. I served it with a simple side salad. Clean up was a BREEZE, you guys. I always try to dirty my kitchen as little as possible on weeknights, because who feels like doing dishes forever? I hope you and your family love this paleo skillet dinner! A make-ahead twist on two classics, pizza and shepherd's pie, this simple skillet recipe is hearty but not heavy. Drain water from pot. Mash the potatoes. Add ghee, broth, and salt + pepper. Continue to mash until no lumps remain. Cover potatoes and set aside. FOR MEAT LAYER: In a large 12-inch cast iron or other oven-safe skillet, over medium-high heat, add 1 tbsp oil, then add ground turkey, onion, and peppers (if they're raw). Cook and crumble meat until browned. Stir in tomato sauce, salt, basil, italian sausage seasoning and peppers (if using frozen). Bring to a boil, then reduce heat to medium-low. Remove meat from heat. Spread mashed potatoes evenly over the top. If serving immediately: bake for 30 minutes. Add pepperoni when 15 minutes remain. If making ahead for later: Place pan in refrigerator. When ready to cook, preheat oven to 375° F. Bake for ~45 minutes. Add pepperoni when 15 minutes remain. For picky eaters- remove 1-2 servings of mashed potatoes before topping the dish to serve plain on the side. I also removed some plain turkey for my son before adding the sauce and seasonings.